Although we didn’t expect our room in Oxford to be available until mid-afternoon, we decided to make an early start from London. From Grosvenor Gardens we took the Oxford Tube, a coach which runs several times per hour, makes the journey to Oxford in around 90 minutes, and has a stop in the High Street almost outside of our hotel, The Old Bank. Staff kindly stored our bags until our room was ready, while we were out and about. For lunch we ate on George Street at the excellent Côte Brasserie. At the Bodleian Library shop in the old quad we picked up some cards with Tolkien art, then spent time in Blackwell’s and in the new Bodleian shop attached to the Weston Library (the former New Bodleian). We had arranged to pick up four copies of the Tolkien exhibition catalogue in advance of publication: two trade hardbacks as our authors’ copies, and a trade paperback and deluxe hardback we had ordered. The staff were then clearing tables and shelves, preparing to put out Tolkien-related merchandise the next day. At the Old Bank we were given (at a higher rate) a very nice room on the front of the building, overlooking the High, with window seats and a (non-functioning) fireplace. There was scaffolding in front of our windows, part of a renovation project, of which the hotel had warned us and gave us a discount for the inconvenience, but our view wasn’t badly blocked, and we never saw or heard anyone use the scaffolding. The only issue we had was on the Saturday night, when customers below us shouted and cheered very loudly until midnight over some sports match, and the sound carried. On Wednesday night we had dinner at high table at Exeter College, to which we had been invited by the Rector, Sir Rick Trainor. Williams College has a cooperative arrangement with Exeter, whereby selected Williams students spend their junior year at Oxford. For the past two years, Exeter students have in turn come to Williams for two weeks in January, and Wayne has helped to teach them, using rare materials. Dinner at high table is a fascinating experience, part ritual, part socializing. This dinner happened to coincide with exam period, and the hall was filled with students in high spirits. As the days progressed, we saw many students on the streets hurrying to exams, each by tradition in ‘sub-fusc’ and gowns and with a carnation: white for the first exam, pink for those in the middle, red for the last (supposedly symbolizing the scholar’s life-blood poured into the effort). While in Oxford we had our breakfasts at Quod, the restaurant in the Old Bank. Quod has good breakfast offerings, though still a limited selection. Christina usually had eggs benedict, but always asked for only one rather than the standard two, as she can eat only one and doesn’t like to waste food. After a couple of days, the restaurant charged for only one, half the menu price, which was very kind of them. Wayne usually had fried or poached eggs, with very good toast. One morning, he tried the banana pancakes but was disappointed to find that this was just regular pancakes with sliced banana. After breakfast on Thursday we went to the admissions office at the Weston Library to renew our Bodleian reader’s cards, planning to do work in the Tolkien papers the following Monday. Admission was a smooth process – we had filled in the forms in advance, from the Libraries’ website, and had brought the required proof of address, etc., as well as our old cards – and since we planned to use material only in the Weston Library, that is, not in the Old Bodleian or at some other library at Oxford, we paid no fee. From there we returned to the Weston shop, and were pleased to see that a wide array of exhibition merchandise has sprung up overnight; we had had reason to think that they would hold off until the evening opening. As it was still hours before the private reception and a day before the general public could see the exhibition, and most other Tolkien fans attending the opening had not yet arrived in Oxford, we more or less had our pick. Staff kindly arranged to have some of our purchases shipped to us (e.g. pillows and mugs), while we bought separately items we could more easily carry home (such as tote bags and small posters). We would return to the shop several times in the next days, as a few other items, such as the Tolkien Treasures book (a reduction of the main catalogue), were put out. We splurged on the deluxe set of reproductions of Hobbit art, leaving the Lord of the Rings set as we thought it less interesting a selection, and decided not to buy any of the jewelry based on Tolkien designs, as we thought that the various pieces didn’t convey the delicacy of the original art. We spent the early afternoon looking in shops, and had lunch at the larger of two Prets in the Cornmarket. After changing, we were in Blackwell Hall, the lobby of the Weston Library, in good time for the preview of the Tolkien exhibition. While waiting, we looked at a small display of editions of Euclid’s Geometry and of books inspired by Euclid. We had been offered a private tour of the Tolkien exhibition by its curator, Catherine McIlwaine, and had signed up for the first of three, at 4.00. Others who had written for the catalogue, and additional guests such as Wayne’s friend from the Arthur Ransome Society, Christina Hardyment, were also there. We were torn between renewing acquaintances, or speaking with people we had not met before, and looking at the exhibition. Fortunately, we had already booked tickets for the exhibition on two other days. 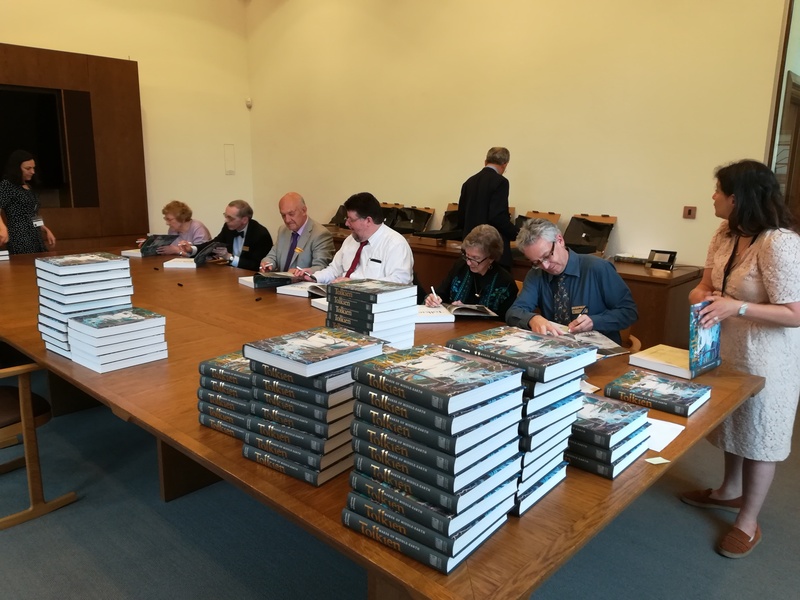 Around 4.30 we were called away to sign copies of the Bodleian catalogue with our fellow authors, mainly for Bodleian or Oxford staff and friends. A production line was set up in a private room, and catalogues were quickly passed from one author to the other, from John Garth, to Verlyn Flieger, to Carl Hostetter, to Tom Shippey, and finally to us, according to the order of our contributions as printed. Some, with shorter names, were able to sign quickly; Wayne found it hard to keep up, with all of the curves in ‘Hammond’. Altogether we signed 82 copies in about an hour, then hurried back to the exhibition while we still had some time. By then, guests (we heard that there were at least 300) had begun to arrive for a 6.00 reception. In the circumstances, we weren’t able to meet or speak with as many people as we would have liked, and apologize to those to whom we were able to say only a few words. We ran into Baillie Tolkien (Christopher’s wife) and Cathleen Blackburn (Tolkien Estate attorney) in the exhibition, and found Priscilla Tolkien in the crowd and confirmed a lunch date with her. We were delighted to see Colin Harris, former head of the Bodleian reading rooms, who gave us so much help over the years when we were doing research in the old Room 132. We also met many old friends from the Tolkien Society’s Northfarthing (London) Smial, as well as some Society members we hadn’t seen in a while, such as Pat and Trevor Reynolds. Brian Sibley and David Weeks were there, and David Bratman of Tolkien Studies, and several persons we knew only from the Internet. We also saw David Brawn and Chris Smith from HarperCollins, and were introduced to two representatives of Tolkien’s continental publishers. Soon after 6.00 there were speeches by Richard Ovenden, Bodley’s Librarian, and Tolkien’s grandson Michael. Nearer 7.00, those of us with special dinner invitations were escorted across Broad Street to the Divinity School, the oldest part of the original Bodleian Library. Also at our table there were Carl Hostetter, Stuart Lee from Oxford, Shaun Gunner (Tolkien Society chair), scholar Dimitra Fimi, and artist Alan Lee. Unfortunately, the table was so large that one could mostly talk only with those immediately to one’s left or right: Christina was between Carl and Wayne, and Wayne between Christina and Catriona Cannon, Deputy Librarian of the Bodleian. Richard Ovenden spoke again briefly, and Baillie Tolkien spoke for the Tolkien family. Fortunately for us, the storm that blew through Oxford that evening began and ended while we were in the Divinity School, so we were spared having to deal with the rain and flooding of the streets. By 10.00 the next morning we were back in Blackwell Hall for the first of the ticketed viewings of the exhibition. Many others had booked for the first time slot also, so we saw many familiar faces. Before long there were many Tolkien scholars and enthusiasts in the exhibition room at the same time – now joined by, among others, Americans Lynn Maudlin and Bruce Leonard – and in the general excitement voices sometimes rose beyond the norm, further flustering the guards who, already dealing with bigger crowds than usually seen, were also having to warn people not to take photos, or that a backpack had to be either carried or worn on the front. One enters the exhibition through a short hallway in which parts of a map of Middle-earth are projected on the floor and Tolkien’s design for the doors of Moria on the wall. Inside the gallery are nine glass cases, some very wide, containing manuscripts and works of art by Tolkien, artefacts such as pipes that Tolkien smoked and one of his writing desks, maps, books, and fan letters from the likes of then-future writer Terry Pratchett and singer Joni Mitchell. A great deal is compressed into a single large room. Jeremy Edmonds of the Tolkien Collectors Guide website, with Jason Fisher and Marcel Aubron-Bülles, has drawn a map and key to the show. The printed map of Middle-earth from The Lord of the Rings that the Bodleian purchased a few years ago, with annotations by Tolkien and Pauline Baynes preparatory to Pauline’s poster Map of Middle-earth, is on display (and available in reproductions), as are Pauline’s original paintings for A Map of Middle-earth and for her Hobbit map, There and Back Again. Slides of Tolkien manuscripts and art are projected within the gallery, there’s an interactive map for The Lord of the Rings as well as a three-dimensional map showing the progress of events in The Lord of the Rings, and there are two terminals at which one can test one’s knowledge of Elvish or hear Tolkien read. We had held in our hands many of the items on display in the course of our Tolkien research, but any item can be seen in a new light when put on view behind glass and expertly lit, Tolkien’s art especially when taken out of the window mounts in which it’s stored. Even so, we were most interested in items we had never seen, some of which were lent by the Tolkien family, and we made many notes, for example of the details of Tolkien’s World War Two identity card. Wayne was told off by one of the guards for taking notes in pen rather than pencil; Wayne knew that one is supposed to use only pencil (or a computer keyboard) when working in a rare books library or archive, and as a rare books librarian himself always carries a pencil, but in more than forty years he has never known that rule to apply in an exhibition hall, where everything is behind glass! As noon approached, we again visited the Bodleian shop, and on the steps of the Weston Library came upon some of our friends who were being interviewed by two women from BBC Radio. We stood by in case we were also wanted, and indeed spoke with the BBC crew, who had come to realize, as Wayne put it, that they had stumbled into a nest of Tolkien scholars; but they weren’t sure how to handle a pair of them at once. In the end we weren’t recorded, as the crew already had a lot ‘in the can’, and we’ve not been able to find that anyone recorded that day made it to the air or to the BBC website. Instead, the BBC released a video of a Tolkien fan who has ‘mastered Elvish and Dwarvish’ (serious enthusiasts will understand this necessarily involves a certain amount of invention). That afternoon, we walked to Walton Street in the Jericho neighbourhood for a guided tour by Sir Rick Trainor of Cohen Quad, Exeter College’s new building on Walton Street which combines student accommodation, classrooms, a learning commons, a café, and – which Wayne was particularly interested to see – new rooms for the College’s rare books collection. The building is a good example of new construction on an existing and limited footprint, while retaining a historic façade, the exterior of the former Ruskin College. On arrival at the Quad, we were joined by Verlyn Flieger. Following the tour, the two of us had a late lunch or early dinner at a restaurant further down Walton Street we had wanted to try, Brasserie Blanc. Around 6.00 we met many other Tolkien enthusiasts at the King’s Arms pub near the Weston Library. We were glad to have time to speak at least briefly, as far as speaking was possible over a general din, with Beregond (Anders Stenström) from Sweden, Yoko Hemmi from Japan, Andrew Ferguson (a Tolkien collector we had previously known only online), Daniel Helen from the Tolkien Society, scholars Nelson Goering, Holly Ordway, and Michael Ward, Laura Schmidt from the Marion E. Wade Center, Bill Fliss from Marquette, et al., as well as Tolkien Archivist Catherine McIlwaine from the Bodleian and, again, our Northfarthing friends. This morning we had time to kill before meeting friends for lunch, so wandered to the Proscholium at the Old Bodleian to see a small exhibition on science in the First World War, to the shop at the Ashmolean Museum, to St Philips bookshop in St Aldate’s, and again to the Weston Library shop, where we added two more posters to our Tolkien-related purchases. As we still had time, we saw the other, smaller Bodleian exhibition, Sappho to Suffrage, on ‘achievements of women who dared to do the unexpected’, such as advocate for the vote. In Blackwell Hall we met friends also going to the lunch scheduled for 1.00. Since Broad Street by this time was filled with a parade celebrating gay pride, we walked with Jeremy Edmonds along Parks Road, skirting the crowds, and came out to St Giles’ via Museum Road and the passage next to the Lamb and Flag. It had been suggested that we have lunch at the Eagle and Child in St Giles’, the best known of the pubs frequented by Tolkien and the Inklings, but lunch was in full gear, on a Saturday no less, and it was immediately clear that if we were to fit in the ‘Bird and Baby’ at all, we would be scattered. Instead, we crossed the road again and were able to claim the back room at the Lamb and Flag, which had also been an Inklings pub. While at lunch, we learned from Laura Schmidt that Taruithorn, the Oxford Tolkien group, was having a strawberry picnic in the Masters Garden at Christ Church and that we would be welcome to attend. We trooped there, and after John Garth made inquiries, were able to get to the right place, away from the tourists who come to see a college associated with Lewis Carroll and (in the movies) Harry Potter. Wayne thought that it was very much an Alice’s Adventures in Wonderland moment, as the picnic was at the edge of a croquet lawn. Eventually we made our way back to the Old Bank, to rest before going to dinner at the home of our friend Christina Hardyment, author of Arthur Ransome and Captain Flint’s Trunk, among much else. This was just a short bus ride west of central Oxford. We had a lovely meal and a walk in Christina’s extensive garden, also with Samuel Fanous, head of Bodleian publishing whom we had met at the exhibition opening, Peter Groves, the vicar of St Mary Magdalen in Oxford, who by chance had also been at high table at Exeter, and Peter’s wife Beatrice, of Trinity College, Oxford, author of Literary Allusion in Harry Potter. After a quiet morning, we were picked up by our friends Jane, Chris, and Eileen for lunch at The Perch, northwest of Oxford on the Thames. The Perch attracts many visitors, not only because of its age (parts date to the 17th century) and the quality of its food, but because it was a favourite of Lewis Carroll, C.S. Lewis, and Inspector Morse. Although the restaurant area was crowded, we had a good table, the weather was lovely, and The Perch puts on a substantial Sunday lunch. Afterward, we wandered through a patch of woods down to the river. We had hoped to meet another friend for dinner, but this plan unfortunately fell through. Instead, we went to Quod for a light meal. A busy day. We were at the Weston Library when it opened, navigated the security gates, found the lovely new reading rooms, and picked up material we had pre-ordered from the Tolkien papers. There were several things we wanted to recheck that we had been unable to see again in earlier years (when we were writing the first Companion and Guide), due to the papers being processed and so unavailable. We were also able to have a few words again with Catherine McIlwaine, and were pleased to chat more with Colin Harris who, though retired, volunteers at the Library. We interrupted our work at midday to have lunch, as arranged, with Priscilla Tolkien at the restaurant in the Cotswold Lodge. We try to see Priscilla whenever we’re in Oxford and always have a lovely time. Afterward, we returned to the Weston, completed our work, and said goodbye to some of our friends, other Tolkien scholars taking advantage of being in Oxford to visit the Bodleian, as we weren’t sure we would see them all again before we flew home on Wednesday. On the way back to the hotel, we picked up sandwiches from Pret to eat in our room. After a morning meeting, we had lunch again at Côte Brasserie, then went back to the Weston. We had booked to go the exhibition again this morning at 10.00, but had had to miss it; however, Catherine McIlwaine kindly arranged for us to get passes for 2.00 p.m., and we spent another hours and a half among the displays, making sure that we didn’t miss anything. Some of our friends were there again as well, and we were able to say hello to Andrew Higgins (editor with Dimitra Fimi of A Secret Vice) who had not been able to attend earlier. At the shop we bought up yet another of the larger Tolkien posters, which we added to the items to be shipped. For dinner, rather than go to Côte yet again, as we had just been there for lunch, we went to Zizzi’s further along George Street. Afterward we wished that we had gone to Côte after all, as the food is better there and the rooms less noisy. Then it was back to the Old Bank to pack for our return flight. Now we broke out a fourth (soft) bag we always carry with us, to accommodate our copies of the Bodleian catalogue as well as, inevitably, a few more books acquired while in Oxford: Tolkien Treasures, a reduced version of the Maker of Middle-earth catalogue but worth having in its own right, and two used titles from the Oxfam shops in St Giles’ and the Turl. In the morning we took a coach to Heathrow, and as we were returning on in first class were able to have a nice lunch in the Concorde Room lounge (including, for Wayne, a ‘vegetable broth’ which was less broth than bisque, and much the better for it), then relax until boarding a 5.00 flight, to arrive in Boston at 7.40 local time. This journey was less fraught than our outward flight, with good service from British Airways and an excellent in-flight meal, and thanks to a helpful young agent in Boston we navigated the unintuitive new Immigration passport and fingerprint readers at Logan without too much delay. We returned to the Courtyard hotel for the night, and drove home the next morning, shopping for groceries and picking up our held post on the way. Although we had read a proof of the Bodleian’s Tolkien catalogue before our trip, now we had ahead of us a closer reading and analysis, to pick out information to include in our online addenda and corrigenda. We also can look forward to a version of the Tolkien exhibition crossing the Atlantic to the Morgan Library in New York at the end of January 2019.